BEIJING (AP) — North Korea's foreign minister said his country remains committed to ending its nuclear weapons program in talks Friday with his Chinese counterpart, according to China's foreign ministry. 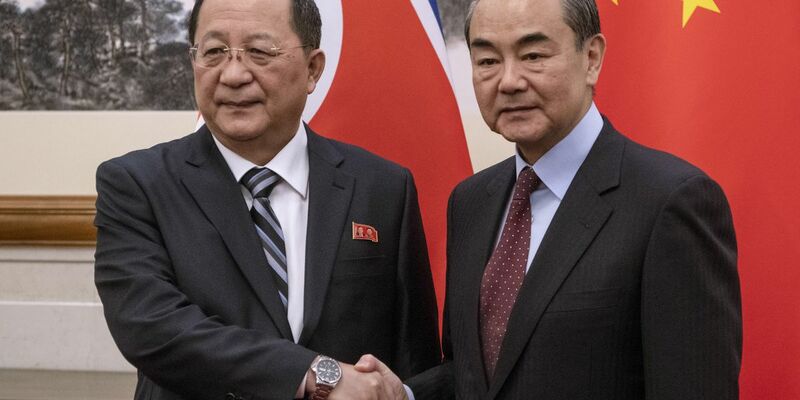 The talks in Beijing between Ri Yong Ho and Wang Yi came amid a lack of progress in international efforts to persuade North Korea to reverse its drive to build a nuclear arsenal. China is North Korea's most important ally, but has agreed to increasingly strict United Nations economic sanctions over its programs to develop nuclear weapons and the ballistic missiles to deliver them. Ri told Wang that North Korea is "committed to realizing denuclearization and safeguarding the peace and stability of the (Korean) peninsula," ministry spokesman Geng Shuang told reporters at a daily briefing. In the talks, Ri was also expected to have been briefed on discussions last week between Chinese President Xi Jinping and U.S. President Donald Trump, who recently said his next meeting with North Korean leader Kim Jong Un would likely happen in January or February. Ri later paid a courtesy call on Xi, who told him, "The international and regional situation as well as the situation on the Korean Peninsula remains in flux." "So timely exchanges and the coordination of positions between China and North Korea are still extremely essential," Xi said. Despite initial optimism generated by Kim and Trump's June summit meeting in Singapore, diplomacy has since come to a halt amid disputes over a U.S. demand that North Korea first produce a full inventory of its nuclear weapons and take other denuclearization steps before winning significant outside rewards. China, which fought on North Korea's behalf in the 1950-53 Korean War, has suggested a more staggered approach, including a suspension of large-scale South Korean and U.S. wargames on the peninsula. In addition to sanctions relief, North Korea wants a declaration on a formal close to the war, which ended with a cease-fire, not a peace treaty, and other reciprocal measures from the United States. North Korea has argued that it has taken some steps, like dismantling its nuclear testing facility and releasing American detainees. While traditionally close ties between China and North Korea have frayed somewhat, Xi hosted Kim for three summits in China this year, both before and after his Singapore meeting with Trump. However, Xi did not attend celebrations of the 70th anniversary of North Korea's founding in September, seen as a sign that Beijing expected more concrete steps by Kim toward denuclearization. Despite that, Geng said bilateral relations had "entered a new historic stage," and the sides would "continue forging ahead with the development of the peninsular situation in the direction of denuclearization." Ri's visit also comes amid intense speculation over the possibility that Kim will visit South Korea this month, in what would be the first such trip by a North Korean leader since the war.